Just a scant two weeks after the groundbreaking toy video "The Crap Club!" hit the internets a breathtaking new sequel has been launched! If we have learned anything from YouTube it is that toys + food = funny. I also think this is probably as good a place as any to break the page. This third Smblog page has been a pretty ok page I guess, what with ECCC coverage, duct tape SCUBA gear instructions, and the whole Underwater Fortress thing, whatever that was. Is hyperprolix a word? Page 4 should be loads of fun, too. Look for that in a while. I have some Census updates to do and a few other videos in the works, and I've been spending some time working on the cheap parts of the Fall Apartments this week, so lots of stuff to cover still. We'll keep playing and we hope you will, too. Sometimes old things become neat new things without much hassle. This week I made a short video using some still photographs that I took years ago in the front yard. That was way back when they had this crazy old stuff called "35 mm film" and it was very expensive, and you had to wait for agonizing days to get your pictures back. So, I scanned those 35 mm prints and I ran them through The Ken Burns Effect, then added a little banjo music and bird chirps (it's all part of my iLife) and PRESTO! I swear, Apple makes it almost too easy to have fun. Here is the link to the entrepreneur video on Youtube. We hope you like it as much as we do! 06/17/07 ::: The Crap Club! This week wearesmall.com is proud to launch our second wee feature video at YouTube! We decided to get a new camera and it had a video feature, and one thing lead to another. You know the game. In much the same way that Mr. Bones leapt into being, The Crap Club has recently arrived from a lengthy stay in Kid Memory Land! So this is the story of the Crap Club. When I was a kid I was part of a clandestine cell of children dedicated to the grossness of food. Each of us would find a cunning way to surreptitiously gather resources from the cafeteria, and then after lunch we would all meet by the back fence and mix up the various things we had lifted. We all tried to bring something grosser than yesterday, and each tray of hideous mixed-up food we created was marked with a french fry "C" before it was slid under the fence. This was The Crap Club! I hadn't thought about The Crap Club for decades. 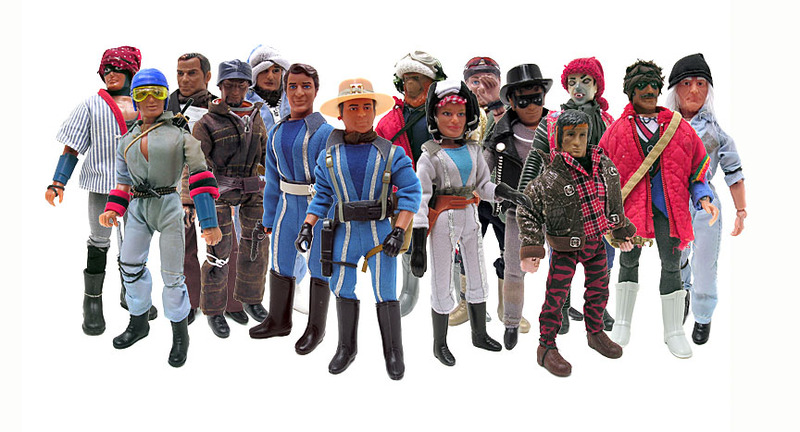 One day I told my first wife the story and she immediately went about the critical business of making toys and forming The Crap Club as we know them today in modern film. We discovered in that process that these toys had embraced the harsh monikers that bullies had given them, as a means of reclaiming lost dignity and whatnot. Their leader is Cathy Bathy, unafraid to hold contraband in her locker. Other members include popular mathlete Jason Basin, and the mercurial White Paint. Another true story - a guy I worked with years ago named John White revealed to me one day that when he was a kid, other kids teased him by calling him "White Paint." Can you imagine the unbearable shame? He said it was totally devastating and he suffered under the nickname for a kid's forever. And then somehow his tribulations became an action figure. I recorded The Crap Club! soundtrack first (Garage Band) and then made the film with our neat new camera, iMovie, some desk lamps, and some other junk I had sitting around. And now it's on YouTube, so there you go. "It's the most disgusting thing I've ever seen..."
The Wayne Foundation was a great playset and became even cooler as an underwater headquarters at a secret undersea location, but that wasn't the whole story. The room where this historic picture was taken was on the 2nd floor of a huge apartment complex in Long Beach CA, somewhere on Los Coyotes Diagonal. The Wayne Foundation sat under the window in the corner, and Part 5 : The Entire Right Half of the Picture represents everything in that corner on the other wall. Well, not everything. Beyond the edge of the picture are (some things we'll talk about soon), and beyond those were my bricks-and-boards. 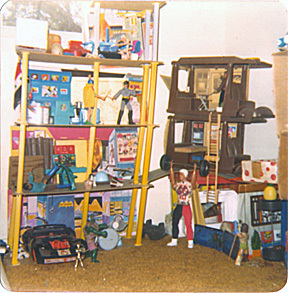 This was a 5-level cinderblock and lumber assembly that housed my kid-safe record player and kid records on the bottom, and all of my Star Wars figures in various scenes from the movies on the other levels. Unlike the Mego Guys, the SW figures were posed in recognizable and static ways, very much like I imagine most modern toy collectors arrange and fuss over their possessions today. Except for the few cool SW figs who eventually filled out the ranks of my Bad Guys, that wonky collection was mostly for show and I'm pretty sure that is part of why I have none of them today, and why they didn't make it into this or any other picture. Years later I traded my remaining SW figures for nekkid Scottie and Robin Mego figures, and I still feel ok about that deal. I mean, you couldn't even turn their wrists. Who needs that? So that's what isn't in the picture. What is in the picture is even weirder. Let's start at the bottom and work our way up. Well, let's skip the ochre shag carpet and work our way up. In the bottom right of this picture you can see one of the weirdest Bad Guy toys ever, made from a Planet of the Apes chimp who had both legs broken off at the knee. Wearing Robin's green underwear and layers of masking tape (to hold his chest pieces together) this guy could have been called "Dr. Leftovers" for all the craftsmanship involved. Notice he is wearing one of Batman's gloves. Harder to see is the fact that he is wearing one of Big Jim's hiking boots on the right leg (well, knee). On his left leg-knee he has more masking tape which holds in place a brown plastic clip intended for use in Big Jim's camper, to hold the rear flap closed. It also made a great left foot in a pinch and it helped a busted body to stand again (albeit at the knees), turning junk parts into a great (albeit evil) toy once more. Behind "Dr. Leftovers" you can see the back wheels from the LazerVett, with a lemon juice container on top. I don't even know why those parts are stacked there like that, except that wheels seemed out of place on a sports-car-submarine and I didn't want to just throw them away. I think there was emergency oxygen in the lemon, or something. To the right of the lemon and largely out of frame is the rest of the Underwater Fortress, which amounts to a USS Enterprise Bridge playset (the blue that is seen just to the right of the wheels), and a few cardboard boxes that served as living quarters stacked on top. The Bridge set was a large decompression chamber for the fortress (my mother worked for a commercial diving school at the time so I was all hip to the dangers of nitrogen expansion at an early age). The cardboard box living cabins were pretty much like they sound. I always liked seeing the crew's personal quarters on Star Trek and those boxes were for that stuff. On top of the cardboard cabins you can see the noses of two soap bottle ships. These were my first custom toy crafts and they were made from Ivory dishwashing liquid bottles with an oval cut into one side. Picture a plastic one-man kayak with a no-spill cap at the bow and you get the idea. Ok, back down to the ochre shag and moving leftwise from "Dr. Leftovers" we can see two blueish panels blocking the entrance to Big Jim's Kung Fu Studio. The blueish panels were cards that came with my USS Enterprise Bridge set, intended to hang on the wall as exciting content for The Main Viewing Screen. I was so bummed that I got duplicate screens (imaging that I missed something cool as a result of getting two of the same) that I decided to use both of them as false walls for the Kung Fu Studio, which served as the Commander's Quarters. The styrofoam window and the plush interior within were all inspired by Capt. Kirk's quarters, although I don't recall Kirk having a wicker ladder from a birdcage in his cabin, ever. In front of The Commander's Quarters is the evil menace that was Pulsar. Like Mazinga and a host of other larger-than-usual toys, Pulsar was a robotic doomsday-type creation of the Evil Bad Guys who was routinely dispatched to destroy all that was good and right in the universe. Here he is seen preparing to hurl the front wheels from the LazerVett at Grog in The Garage, which upon reflection is a pretty good argument for throwing those wheels in the trash instead of leaving them around, cluttering up the Fortress as potential hurling fodder. I'm pretty sure that "Dr. Leftovers" is in complete mind control of Evil Pulsar's evil tossing actions because of their identical (evil) arms-up stance. The last bits to cover in this important historical document are the two brown Big Jim Campers, stacked one-on-the-other. These units were also personal quarters for the crew although I can't remember who lived where anymore. Thirty years of distractions have erased a few details here and there. I can tell you that in the top cabin there is another toothpick sword fight in progress between a cheap glow-in-the-dark skeleton (seen sitting) and a Good Guy made from a Capt. Kirk in Klingon's uniform top. You can see that his right arm is held up in proper fencing position, so you know this guy is a true warrior. I think he was a Security Chief and I'm pretty sure he also wore a Klingon's red phaser belt. That just makes sense. So yeah, that's the one good picture I have from my childhood toy collection. I hope that some of it made sense for you there, and you should know that not all of it makes sense to us here. I have two other photos from the dawning of Small Time and maybe some day I'll dig into those for you, my legions of fans. The bottom level of the my Underwater Fortress was reserved for submersible maintenance and parking. You'd be surprised how often a toy vehicle can break down on any given adventure. Or maybe you wouldn't. The first thing of note in any left-to-right evaluation of The Garage is the rocket motorcycle partially visible on the far left boarder. This was an Evel Knievel bike and, like so many other great toys from my yoot, I wish I had one today. Obviously, the rocket motorcycle worked perfectly underwater. You still needed to suit up in your duct tape SCUBA gear but once you were out in the open sea on your rocket motorcycle it was as natural as anything else. Just to the right of the rocket motorcycle one can see major support columns at disturbing and even jaunty angles, early evidence of the "intuitive construction" methods I would partially develop later in life. I should have pointed this out before because the whole place is at a slant, if you haven't noticed. I assembled the Wayne Foundation myself and was apparently pleased with the level of craftsmanship seen here. The real star in the Garage was the Laser Sub, the black car there next to the wonky beams. This was a Big Jim LazerVett with the wheels removed and it was the coolest spy-sub-sports car a kid could imagine. Big Jim's car had some guns that popped out of the hood but I never had (or promptly lost) those parts, so I used the empty forward area to stow various containers of supplies and complicated equipment. My vehicle had beams that came out of the headlights, so who needed those pop-out lasers anyway? The shiny blob standing in front of the Laser Sub is a C3PO figure. I'm pretty sure he was a Good Guy and may have been a technical assistant to the mechanic, Grog. In case you don't know, Grog is the Hulk doll there in the center. As detailed in other parts of this web site, Grog are amphibian aliens with great mechanical aptitude. The Grog pictured served with the Good Guys for many years and through many harrowing adventures, and is now retired. One of the greatest mysteries in this picture is the winged Thor helmet that Grog is wearing, since I never had a Thor figure and didn't even see one until I was an adult. Crazy. Just behind Grog is a round gray object with a smaller round white object resting near it. These innocent looking blurs are the only surviving visual evidence of one of the greatest toy vehicles in modern times, the Bat Elevator Submarine! According to the instruction sheet, the Bat Elevator was supposed to ride in between the two structural beams on the far right and connect the levels of the Wayne Foundation. As it turned out, I had some trouble getting this action feature to work properly (could it have been the slant, you think?) so I eagerly turned the Bat Elevator on its side, included a shampoo cap for a helmet, and suddenly I had a nifty one-man submarine. Lastly, just behind the Bat Elevator Submarine we can see the other half of the blue pantyhose egg that became the scientific robot in the Lab, upstairs. 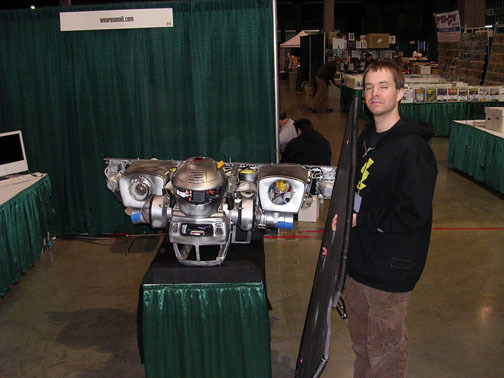 Here the half-egg is not a robot, it is being used as wedge to keep the Bat Elevator Submarine from rolling over on its side. I just wanted to be clear that that isn't a robot. The final episode of Underwater Fortress is next, where we cover in great personal detail the entire right half of the picture!! The best way to understand The Science Lab is to think of those cutaway shots on Star Trek, when Kirk is on the bridge but using his armrest communicator to talk to Scottie or Dr. McCoy in other critical sections of the ship. The Science Lab was where they examined the available clues and got their hands dirty with Science while the Command Team hung out with the Syrian flag and kept an eye on things with the place mat map upstairs. In left-to-right fashion we start explaining this level with the curious chunk of plywood. I used a blue ball-point pen to draw computer controls on this plywood and it was some kind of super-computer, for Science. The plastic log raft behind it came from GI Joe's Mouth of Doom set, a set I never owned and something a little out of place in a laboratory, upon reflection. I guess Science is all about mystery when you get right down to it. Next to the plywood and the plastic log raft is that good old Scientific standby, the Bridge Computer from the USS Enterprise. What a great toy computer that is! I augmented the fierce computing power of the Bridge Computer with a red plastic counting device that had three neat push-button counters on the top, and they kept me busy for many kid hours. I once saw a guy at a swapmeet with a similar device counting folks as they went through the gate, so I assume my counter was one of those but I don't remember what words were printed on the red plastic case so I can't be sure about that. Again, the mystery of Science. To the right of the Bridge Computer we have a whole bunch of low action, which is to say it's all robots on the floor. Among the salient points here is an official Kenner R2D2 figure which can be seen at the base of the central yellow beam. Since I had an awesome masking tape version of R2D2 on the Top Floor this little official collectible thing was assigned to the Bad Guys. Here he is seen doing battle with a staple remover and one half of a pantyhose egg, both of which were Good Guy robots largely devoted to Science but not without a few defensive weapons systems of their own, for days just like this one. 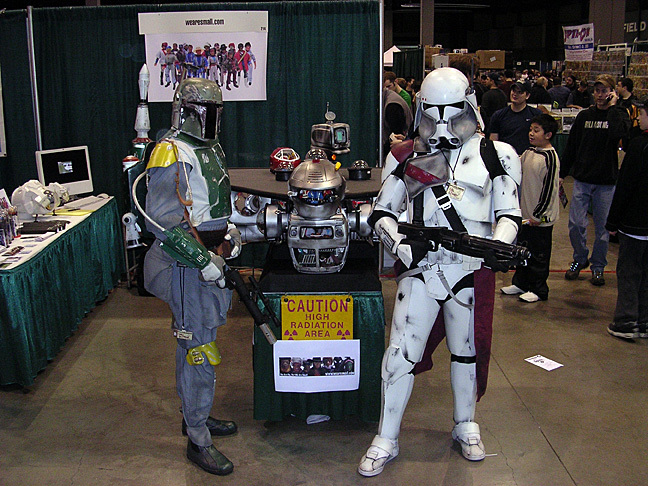 Positioned in front of the R2D2 unit is the torso piece from a type-1 Mego ape figure. I can tell this by general shape and color of the object. I can not, however, give you any explanation as to why it is there, or if indeed it is also a low battling robot. There is just so much we don't know about Science. Central in the Battle for the Science Lab is the bearded Doctor, seen here on his back defending the Lab with a crazy martial arts kick. This figure would go on to become The Captain in later adventures, but he is seen here early in his career wearing McCoy's blue shirt (see shirtless McCoy, Top Level) and Batman's blue boots (see Commander in Klingon boots, Command Level). And yes, in case you were wondering, the Doctor is indeed kicking Gumby in the face. See, the thing about The Bad Guys is that they were mutants and aliens, and they were every other toy in approximate scale that couldn't make it into the ranks Good Guys. So they were toys with an axe to grind, even if it was made of green clay. The Science Lab. For Science. Just for the record, at this stage in the game I called these toys my "guys" but I later dropped that descriptor because it felt funny saying, "I play with guys!" Shortly after that the whole dolly world went into a box or was thrown away. Man, puberty can really cloud the mind. Anyway, the location for my Command Level was probably decided on the fact that it was eye-level when I sat in front of it. Here the big, important computers went, and here was the very symbol of authority, the Captain's Chair. I applied the sticker from Pulsar to the back of the Captain's Chair for some reason. I have never liked decals on toys so that was probably just a place to put the sticker once removed. Let's break this down in a left-to-right manner, which means the we start with the Syrian flag. I've always struggled to come up with a good logo or banner icon to unite my toys, and this flag was an early attempt to inject some kind of doll nationalism, I guess. I didn't know Syria from Santa Monica in those days. I'm pretty sure that I got my Syrian flag at school during a sort of "explore the world" week. This may have been around the time that we learned about Japan with wooden sandals and about Hungary by making goulash. At some point we were invited to pick one of the many tiny world flags from the table to keep, and I went with Syria. Next on our tour of the very important Command Level we have a round instant coffee tin that my Grandma gave me, used here for The Captain's end table. My Grandma was really into flavored instant coffee and she enjoyed my guys, so I'm always pleased to see that can in this picture. I remember it smelled of mocha when you lifted the lid, which I did not often do in order to preserve the secret scent within. Hanging above the Captain's end table you can see the Captain's Canteen, which is from Kenner's totally awesome Official Boy Scout line. In front of the Captain's Chair is the Main Computer (Wayne Foundation's Bat Computer) and OH BOY do I wish I had a few of those things today. It had lame decals of super heros, but who cares? Next to the Main Computer is the Command Coffee Pot. I wasn't even allowed to drink coffee at the time but somehow I instinctively understood the relationship between heroism and java. Behind all of that is a paper place mat that had a map of something on it. I hung this on the back wall of the Command Level because I didn't like the art in that part of the Wayne Foundation, and I imagined that the guys could monitor everything going on better with a giant map. No part of the Underwater Fortress is free of conflict and here on the Command Level the story is the same, only worse. You can see the Lead Bad Guy and the Commander of the Good Guys locked in a deadly toothpick duel! When one breaks down the details of this particular struggle the underlying nature of the conflict within becomes apparent. The figure on the right was the earliest Commander-type figure in my toy team, made by dressing the younger and more dashing Robin in Batman's far superior belt and jumpsuit. He also sports the super-cool Klingon boots, which I'm pretty sure can be attributed to his Command authority. Inversely, we can see that the figure on the right, who was the Lead Bad Guy in this photograph, is a Batman figure dressed in the Boy Wonder's costume. Was it the high yellow collar or the pointed green booties that turned him to Evil? Whatever the truth may be, one of these guys is about to get a toothpick in the gut. And in those days it was always the Bad Guy. So yeah, costume envy. And look at the way they both have their non-toothpick arm up and bent at the elbow as they fight. I must have seen some fencing on TV and figured that was how it had to be done. The weapons here are colored toothpicks with tape wraps for handles, so you know that these are keen warriors with unrivaled battle skills. I also love the big dirty patch right on the Commander's chest where the Batman decal used to be. My disdain for chest decals on toys is so profound that I would rather look at the stains they leave behind. Stay Tuned for the next thrill-packed episode of Underwater Toy Fortress! When I was a kid, all of my toys lived in a secret fortified underwater complex and battled the forces of evil from that amazing headquarters. The only way to access The Fortress was via submersible vehicle or duct tape SCUBA gear (see previous post). In those days everything was pretty strait forward. Good Guys defended everything and Bad Guys tried to tare it all down in the most twisted ways imaginable. I guess the underwater lair was a way to get away from it all. 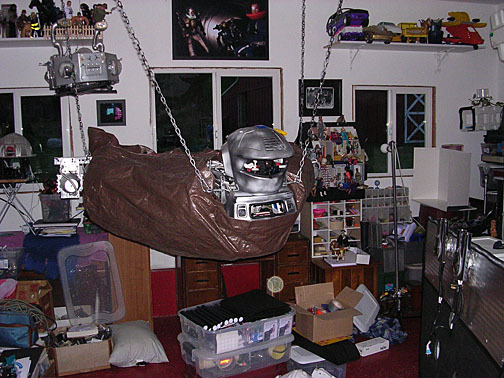 In boring adult terms, my Fortress was a Wayne Foundation playset by Mego, 2 Big Jim Campers (sans wheels) stacked up on a Big Jim Kung Fu Studio, with the Bridge of the USS Enterprise and some cardboard boxes filling out the place. Every level and compartment had a function that I understood. I was really happy living there. I have long wanted to break each level of this picture down for readers of SmBlog, because there is a rich, blurry history that is worthy of preservation, and also because I don't know what else to talk about. So let's go! The top floor was a social area devoted to dolls living comfortably underwater for extended periods of time. It was the top floor and it had a bubble roof so you could look out and see the fish. We can see evidence of many modern conveniences in this image, like the large white cardboard box at the far left which I remember was their cook stove. Also visible in the back is a red computer table from The Fortress of Solitude playset (different scale, but a great table) and the "video game table" and chair from the Wayne Foundation. All of these luxuries made the job of saving the universe a little easier for our heroes. Let's take a second to discuss the tan blob on the left, next to the cardboard stove. That tan blob was my attempt at R2D2, and it was made with an orange plastic top from a BAN underarm deodorant spray can, a styrofoam cup cut from an egg carton, and layers of masking tape. You can almost see the intense detail work I did with a blue ball-point pen. 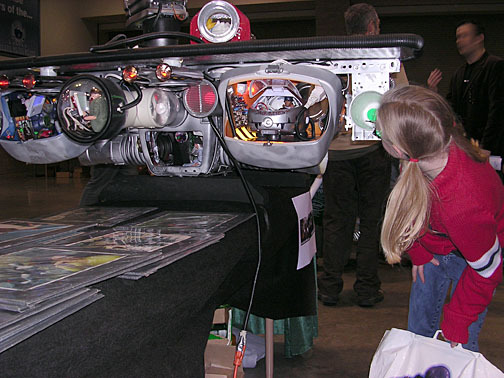 I loved that piece of junk robot. Ok, now we are beyond the living accommodations so let's talk about that fight! It is important to note that I spent a lot of time posing everyone for this shot. It was kid time, but I must have spent like a week setting things up. The concept was "Bad Guys Attack!" which was a common theme in those days. On the top floor we see a struggle taking place between a female ape (her name may have been Lisa) and a helmeted villain. The ape is wearing batman's cape backwards with a twist-tie for a belt, which is still a very attractive look on a chimp, even today. You can't see it in the picture but I know for a fact that she has a cocktail sword in her left hand that has been broken off to dagger size. The Bad Guy beneath the she-ape is far from a love interest, no matter how they might appear in the picture. I'm pretty sure that he is a Dr. McCoy figure, one of the evil scientists on the Bad Guy's side, and he's getting his shirtless clock cleaned by the chimp lady. This villain is so bad he is wearing my best attempt at a stormtrooper's helmet, which was a white shampoo screw-top cap that fit him down to the chin. I drew in the eyes with Sharpie so he was super-mean looking. I think it's pretty clear who won this fight. Remember kids: Never cross a Zira on her own turf. All on the next exciting episode of Underwater Toy Fortress! 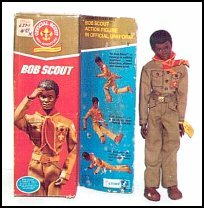 BTW, you and I can enjoy a ridiculous tangential web site about toys like this thanks in large part to good ol' American Freedom. I am humbled by the bravery and excellence of Americans in uniform today and throughout history who stand, fight, and have died for our freedoms. They have my deepest respect and gratitude. I've had this old spinning magazine rack for six or seven years now. Someone I used to know was in the sticker business and she was giving away this old sticker rack and I took it, thinking, "I'll make some doll apartments with this for sure!" You know, like you do. Every once in a while I dig out this heap and tinker with it. Over the weekend it achieved new form so I thought I'd post pictures. I'm not done and it's still ugly, but that's how it goes sometimes. I sort of grafted play sets together and then built walls inside them with glorious duct tape. It has 5 floors and no elevator or stairs (I think they will end up using rope ladders), and I call it the Fall Apartments. It is empty now, but the penthouse has a greenhouse. The exclusive condo villa on the 4th floor boasts expansive astroturf lawn. There is even a shady low-rent area! The first floor is still empty so if your toy or toy based business needs a cool place to set up shop, drop us a line! At long last we have brushed up the Small Census, and were are currently poised at 488. If we really pour it on now, we could hit 500 in no time! The early entries have been phenomenal and we couldn't resist posting them so you'll understand the level of competition. From down here you look pretty freaking ridiculous! All the world is a playset and we are merely Small. Come for the shopping, stay for the fun. It Beats a Kick in the Head. From down here I can see up your pant leg. Yes, I have a favorite. No, I'm not going to reveal which one. Yes, the favorite can still be beat. No, I'm not above bribes. Don't be shy - send us your motto entries right now!! Since I can't seem to come up with "101 Things About Me" or any other traditional blogging subject matters, I have decided to run a contest! Usually in a contest there are scads of people clambering for the really cool Grand Prize but in this instance you not only have a great chance of winning (because the readership here is next to nil) but our prize isn't all that grand, it's just a pretty regular prize! Has the spark of temptation lit a fire of passion in the blood of your veins yet? We sure hope so, because hype is all we have, people. And that's why we are looking for a new motto - the hype. I should first point out that our long standing motto "You Are Big, But We Are Small" isn't being replaced, because honestly it's about the best motto ever, and uncannily appropriate for our endeavors. But we were fresh out of topics for SmBlog and a contest seemed like something we could fake, so here we are. You can even steal a line from someone else! What the heck do we care? Reduce your efforts and increase your odds of winning at the same time by finding a motto that someone else paid a marketing dwarf to produce, and submit it here as your own! Start checking cereal boxes, verbose receipts, amateur wrestling event banners and everywhere else, because the winning slogan might be bobbing out there right now just waiting for someone like you to reach out and slap it on the winning spot. What are we looking for? Something hip, lame, smart, banal, and/or easy to dance to. Something that speaks to the facts, or avoids them altogether. Keep it short or force it to unimaginable proportions, it's all up to you. Just send your motto suggestions to us here, to the attention of us here, and we'll toss your thoughts into our hopper. Yes, we have a hopper. Haven't you ever heard of a motto hopper before? We'll accept entries until midnight on July 4th, 2007. The Big Dang Winner will be announced on this very SmBlog, and will get a really nifty 42x23 T19 Poster and we won't even hit you up for the shipping, either. Must be a legal resident to enter. All entries become the property of wearesmall.com and its subsidiaries, including Cheese Brothers Studios, Articulated Press, and Dressed Like Sisters Farms. Please keep this offer very hush-hush where prohibited. Vote early and often!! Special thanks to Evil Robot, who has sent us an early entry: "I'm Lovin' it!" Thanks ER, we'll have the legal team take a look at that but so far it's the entry to beat! wearesmall.com has been on vacation this week. One of the benefits of living in a fantasy world is that you get to call all the shots, so we've spent the week gardening, making pictures of toys, and otherwise avoiding responsible behavior like the plague. Besides the fun we had with OBEY-inspired celebrities (see 4/25/07), the first thing to come out of this recent lazy haze was a new 2XL+ Episode 6, "The Marigold Maneuver" I like to introduce new things with the 2XL+ saga, sort of like a screen test for larger projects, and in this one I feature the alien toys known as Skekt-auk Overlords. Much too big for their metallic britches, the Overlords are renowned for their bravado and dangerous (to themselves) archaic weapons systems. You can see how pathetic they are for yourself. I never dreamed that my wee space opera would reach six episodes, but since it has I see no reason to stop. Also this week we installed an invisible hit counter at wearesmall.com which tells us who is looking at the site, where they are on the planet (ours), and what they are wearing. Well, maybe I made some of that up, but it has been fun to check the counter and see people tuning in from crazy places like Beijing (China), Krakow (Poland), The Isle of Man (UK), and even the Glasgow Electric Plant in Kentucky! We'd like to say Thank You to everyone who drops in to play with our toys! With our new counter we have also seen that we get a lot of traffic from a site called actionfigurecomics.com. 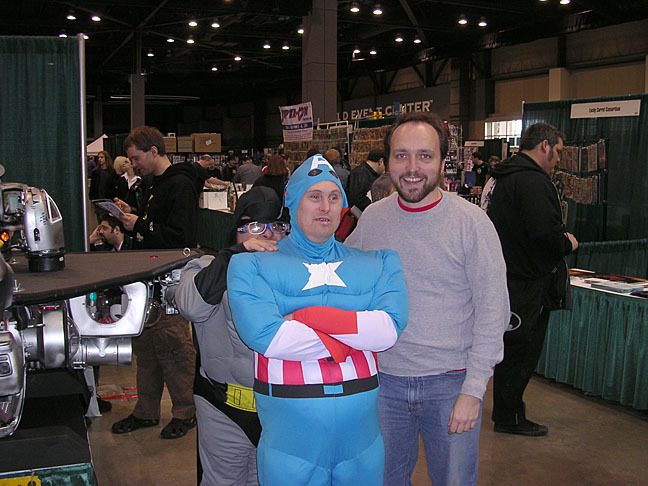 I had the good fortune to meet Erik (the guy behind the site and the creative force behind the web comic "Perils of the Bold") at the Emerald City ComiCom earlier this month and it has been great fun to dig into his on-line photo-comic. I especially like the production notes he includes for each panel. So go enjoy "Perils of the Bold" because we owe Erik some E-karma! The other thing we found this week is a new blog about ugly lunches. In a world swelling with self-interested bloggers this project is a shining example of the unusual things we will put into our bodies when they are free. with pictures of toys ...but I was so wrong! "In the best interest of the child, (jackass) will do what the mother is pathologically incapable of doing ... keeping (her) mouth shut and obeying the court order. Although (jackass) acknowledges that he should have used different language in parenting his child, everyone who knows him privately knows what he has been put through for the past six years." Shame on you, Mr. Jackass. Your puppet has more class. In other news, I'd like to thank the meteor that brought the reptiles to their knees. Too bad it missed this modern one. 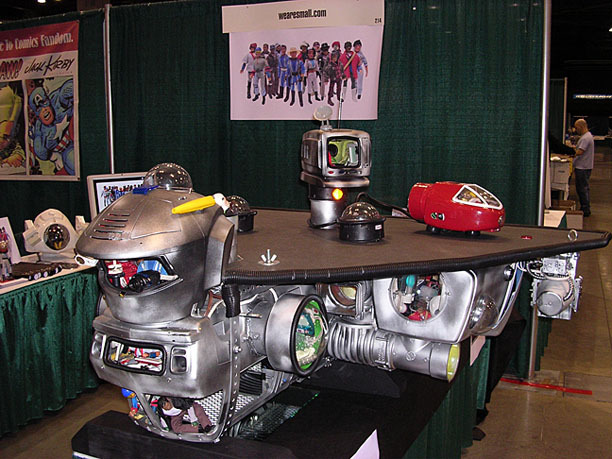 OK, when I was a kid my toys lived and worked in an underwater headquarters (more on that later). Of course you had your submersible vehicles, but if you found yourself without a sub and you had a desperate and possibly heroic need to get somewhere, well then you are going to need some SCUBA gear, pal. My first tape SCUBA suit was with household masking tape but I discovered that the adhesive was weak and became gross over time, and the paper became brittle and browned with play. I needed better materials. If you take nothing else away from this web site, please understand that Duct Tape is one of the finest inventions of the 20th century, and please help to spread that good news to the masses. Without duct tape we would have fewer astronauts, louder children, and nothing with which to fix the screen door. Glory in its gray, gummy beauty. Stick it to your face and hands. But I digress. Duct tape made the best SCUBA gear so I'll use it here, and forever more. Please understand that these are not strict instructions and if you just copy what I do without some innovation or refinement of your own I will mock you publicly, and that should teach you. Note: Some people like to use scissors with duct tape but I do not. To each their own. I don't like to clean stubborn goo off of scissors blades, for one thing, and I also enjoy the ripping sound. #1 Make Straps: Cut or rip a strip of tape as wide as your middle finger and about 6 inches long. The strip is then folded in on itself in thirds, so that the edge of the tape is only seen on one side of the strap. We'll call this side The Back, and the smooth side The Front of the strap. See Strap Folding (right). You will need approximately three straps of this nature. Remember, duct tape is smarter and better than you, so if it takes some time to master these skills that's only natural. #2 Tanks: Take the two AA batteries and wrap them together with succulent duct tape. Now attach two of the straps to the tanks so they form a Y near the top. Then attach one end of the third strap to the bottom of the tanks on one side. Obviously when I say "attach" here I mean "apply duct tape until sturdy". You can do this in thumb-sized patches or strips, it's all good. #3 Size the Straps: Take your toy and hold the tanks on his/her back where you want them to be when swimming. Now tape down the ends of the three straps so that they hold the tanks in place. You can go over each shoulder or they can cross over the chest like our model here, it's all up to you. I usually tape the overarm straps down tight at both ends once they are in place, and I leave one end of the waist strap held by one small, easy to unpeel patch of tape, so the figure can get in and out of the gear more efficiently. #4 Respirator and Mask: Even though it has no actual lungs, your toy needs equipment to breathe underwater just like anything else (except fish). One easy way to accomplish this is a length of lamp wire and some 100% natural duct tape. 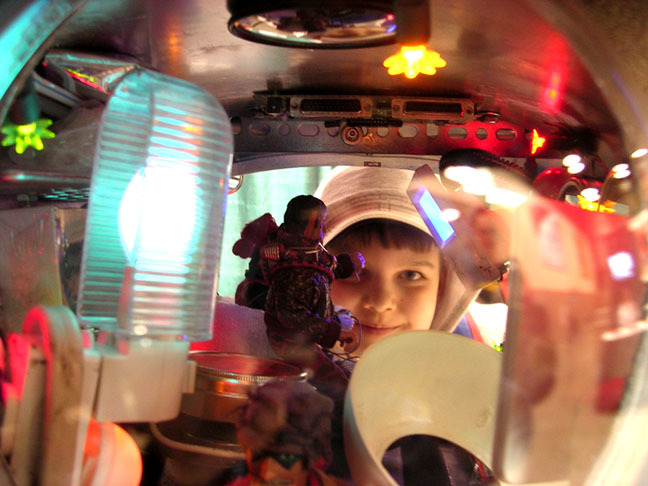 Attach the wires to the back of the tanks and run them out behind the toy's head and around to his mouth. Tape the ends of the wires together, over the figure's mouth. This bit gets taped to the bottom of the dive mask. To make a dive mask you need two more straps as described in #1, but thinner. One strap becomes the dive mask and the other goes around the figure's head (see picture). Remember, the technique of applying multiple complex layers of magnificent duct tape is what separates us from the animal kingdom. And fire and hospitals and the ability to think abstractly, but also tape in layers. #5 Swim Fins: It is tough to get anywhere fast underwater without a good pair of swim fins. As a kid, I had not seen or heard of swim fins that would fit my toys so I had to make my own, again from radiant, all-knowing duct tape. In a nutshell, you make a tape shoe and then apply a fin to it. Here a nice trim with scissors gets points for style, but don't let it get out of hand. #6 The Knife: I have never known an action figure to go underwater without a good knife. It must be in the Revised Code of Toy Behavior or something, because it always happens. I defy anyone to prove me wrong, and if you do I won't listen anyway. So you take your cocktail sword and bust off the guard and the blade so that you are left with a knife. You can sharpen it on concrete or with mommy's nail file. Practice poking yourself repeatedly to assure proper pointedness. To make a sheath you can use a short strip of tape folded in half and wrapped around the knife blade. A short strap for the leg and some delicious duct tape to hold everything in place, and you are good to go swimming! Be sure to make bubble sounds! You will need these things. Sample of strap construction: 1/2 complete. Wires for air. Why not? Fins and Knife: you'll need them. I'm lagging a little today. Now that my first convention experience is over I find that I'm not sure where to apply my energies next. With G7:e1 being re-lettered this year I guess I could start work on G7:e2 The Event Mongers. 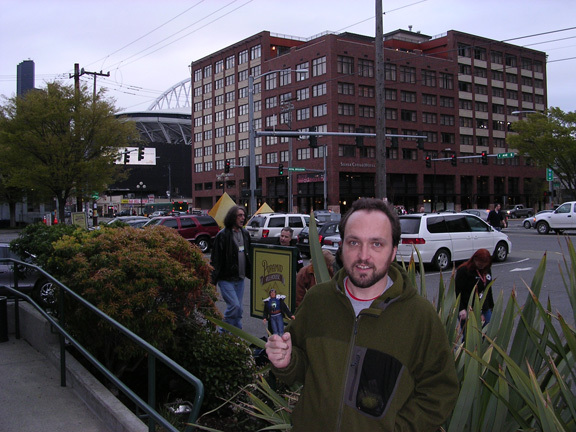 I also enjoyed exposing the innocent public to Trinket 19 and might want to do that again locally. I have a few ideas for the next 2XL+ episode but not enough for a big production. The weather is getting better so Catherine is gunning for an outdoor Carnival setup, and rightly so. It kind of seems like I have all the parts for something fun and new but at this moment I'm not clear on how to assemble them, or what they might become. But that will pass. A few post-ECCC things and then we are done. First, the Special OBO Smallonaut was given to the person who made the best offer, but that person made me swear to never tell who they were, or what the offer was. I am permitted to say that it was a massive cool offer, and if you knew you'd understand why. So there you go, clear like a foggy morning. I decided to open an exclusive on-line store this week. Pequeno: A Small Boutique is something I've been thinking about for a while and it will be interesting to see what happens. In case there is any question, it really is an actual store run by actual toys that live in my actual house. I can't be any more clear than that. So thanks to everyone who made Trinket 19's Maiden Voyage a trip to remember: Catherine, Bryce, Tom, Jon, Jim, George, Mike, Rose, Joe, Nancy, and all the little people, obviously. Stay Tuned for instructions on how to make SCUBA Gear out of duct tape! 04/07/07 ::: You Always Remember Your First Times. There were a few really great personal firsts for me at ECCC. Just as we were finishing our setup on Saturday a video crew stopped by the booth and asked me for an interview. Readers should know that I'm not crazy about crowds or being on camera so this opportunity was a real double whammy, and if not for the overwhelming smile on the face of the interviewer I might have declined my First Interview. But I didn't. I'm really sorry to report that I have forgotten the interviewer's name, but I'd like to thank him very much for turning the camera on me and my giant space ship. I hope I get to see the footage some day, and that I didn't sound as ridiculous as I felt. I can't even remember a word I said. I hope it was English. My next great first was my First Sale, which was a whole set of my Small Books! A very kind woman from Portland named Karen stopped at the booth on Saturday afternoon and read some of our Small Book samples. She said she worked for a TV station in Oregon, and that she would be happy to shell out the $22.00 I was asking for a complete set of eight books. She seemed to enjoy them and that made me very happy. I tried to convince her to put Trinket 19 on TV but I guess it was a "residents of Oregon only" kind of station. Too bad about that, but it really was great to have someone buy something I made. It should happen more often, I think. I did sell a few other things at the ComiCon and one of them was a print of Robots in Love to a very nice woman named Julie. Her enthusiasm for T19 was inspiring and I was pleased to comply with her request to sign the print. Which, incidentally, was my First Autograph. I was so overjoyed that I think I spelled my name wrong! I found out later that she is married to the interviewer (with the name I can't remember), and I hope they find this SmBlog and drop me a line some time. Your support was most appreciated!! My last first was The First Person to Say They Had Seen My Web Site, a solitary honor that goes to the fellow in the Storm Trooper armor! Not only was he kind enough pull Boba Fett back almost 30 feet to take this picture, but he told me later that he had visited wearesmall.com and thought the ship was super cool. I guess visibility is pretty limited in those helmets (something you'd think the Empire would have considered before placing such a large helmet order) so they both came back for an out-of-costume look at T19. Fans in armor are fans, indeed! 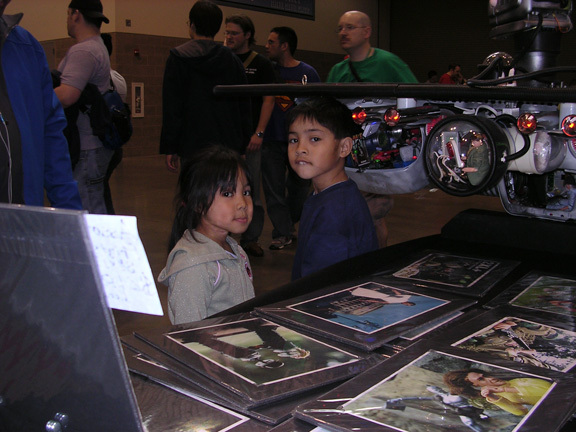 I noticed something about people as they herded by the booth. It's like a little mechanism and after a while I could hear the click. It is a moment when the brain makes a choice about the unknown, to either investigate or ignore the mystery at hand. I suppose there are a great number of psychological factors at play in any given social interaction and I know nothing about any of them, so I'll just use words that I think understand and stick to facts. Imagine two people in a crowd, each looking around at stuff set up on tables, let's say. Subject A and Subject B are externally identical in every way for the purposes of this example, but let's give Subject B a straw hat just so we can tell them apart. During his wandering Subject A happens upon an unusual item, one he has never seen before and one demonstrably different from everything else around him. Subject A's face can be seen squinting or furrowing his unkempt brow as his mind struggles to conveniently box what he has observed. He can not, however, and no matter how he holds his face enlightenment eludes him. And >click!< he walks away. Subject B (the one in the hat), upon finding the same unusual item, may also be seen to squinting and furrowing in contemplation. Like A, he also is grappling with his inability to explain the crazy light-up whateveritis, but instead >click!< he smiles and comes in for a closer look. I watched a lot of As and Bs (and a few Qs and Zs) walk around last weekend and I discovered that the people who greet the unknown with a grin are far more interesting, intelligent and fun to be around than the losers who lumber away satisfied with the limitations of their own comfortable interests. Science seems to be saying that if you can't take a moment to stop and investigate a giant toy space ship when you see one then you are as dry as a stick. Clearly straw hat material, this pair. "There are so many bubbles!" "This is a really impressive... whatever it is!" "You are NOT building one of those!" "Hey, that's my night light!" "They all have iMacs in there..."
"It's got bears in it!" "It's a ship, and it's singing!" "Wow... it's all the figures from, uh..."
"This is like a diorama gone wild!" "Does it use its power for good or evil?" "That's the coolest thing I have ever seen in my life. What is it?" One guy was convinced he'd seen it on the sci-fi channel one night. I was in no position to argue. One guy recognized the DANGER HIGH RADIATION sign that hung below T19 and correctly identified the time period in which it may or may not have been misplaced. One little girl got excited after looking at the toys and told me, "I'M FIVE!" Peter Mayhew, Chewbacca from Star Wars? 04/04/07 ::: ECCC#2 - Being There. 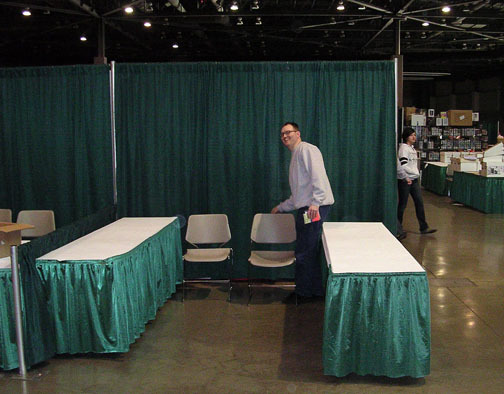 Dealer Booth #214 was a 10x10 foot square of concrete with a fabric backdrop, 2 standard issue 8x2 convention tables, and two matching plastic chairs. The single electrical outlet was absurdly expensive but my space ship needs juice to fly, so what could I do? 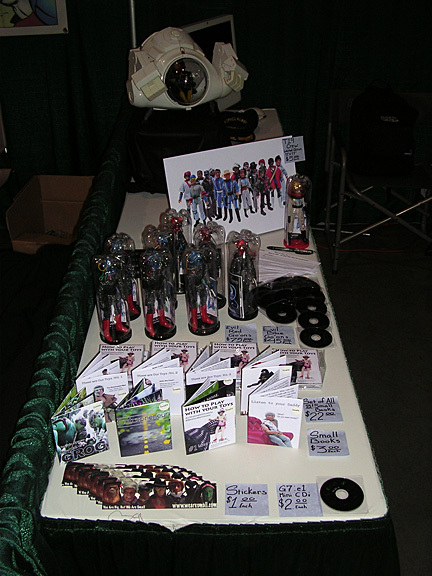 Here is the booth as we left it. Tom is sticking a medical electrode to the back of the chair for some reason. I'll probably get a bill for that. With the help of my awesome Flight Crew we dressed the place up like this and like this. We were right across from the Gigantic Table of Free Stuff, clearly one of the hottest spots at the show, so we were well positioned for maximum gawkitude. And gawk they did! I'll post more visitor stories as I go but my favorite was Little Miss Sunshine, my nickname for her since she didn't tell me her name. In fact she spoke not a word. She made a full ten minute inspection of T19 and I knew she hadn't missed a single detail when she was finished. I could actually see her mind churning hard enough to wiggle her pigtails. After intensive gazing through every bubble window and open hatch of the ship she attempted to fade back into the crowd but before she could I got her attention and asked, "So, what do you think?" She puzzled over my question for a moment like a coy Roman Emperor and then gave me the brightest, most enthusiastic thumbs-up I have ever seen bestowed on anyone, let alone received myself. That level of approval was pretty moving. So yeah, Being There was great. I have always loved observing people in public places and it is clear now that having a giant toy space ship is a perfect recipe for Gourmet People Watching. 04/02/07 ::: ECCC#1 - Getting There. Getting Wink Blinkman to do this post-show reporting would have been fun but his fees were outrageous, and I'm pretty tapped out right now. So you'll just have to get the news from me and trust that everything I say is true. Which it is. I've split things up into parts, this one is Getting There. 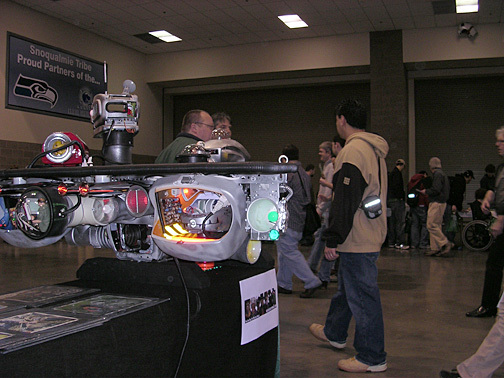 When I bought my booth at the Emerald City ComiCon last November my plan was a simple one, that being to take my giant toy space ship and put it in front of a crowd. I suppose a Plumber's Convention would have been ok too, but there was this comic book thing going on and, oh yeah, I made a comic book with toys back in ought-5. The Con was in Seattle and I live on a moss covered island many miles to the north. 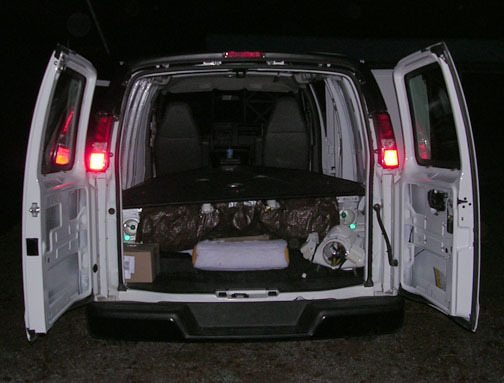 T19's wing was too big to fit in our car (a five foot opening is needed) so I rented a cargo van that was white and glossy and reminded me of 2001: A Van Odyssey. I was saddened and then relieved that it didn't have a smooth talking on-board computer that might refuse to let me back in at a critical moment. I was delighted both with the service at Enterprise Rentals, and the subtle Star Trek tie-in. In her natural habitat (The Red Room) Trinket 19 hangs from the ceiling via four space chains but that kind of thing was impossible at ECCC, so I made a base out of 4x4 wooden posts. I took the ship apart, taped off all compartments and shelves with loose pieces, and I wrapped the chassis with a brown tarp. It looked like King Kong had eaten a robot for lunch yesterday, but it worked like a charm. Anyway, after Maurice and I maneuvered the ship into the van the rest was easy. A box of T19 parts, a box of Evil Go'ons, a box of tools, a box of original books and other Small Product to sell, and my iMac. Compared to the piles and acres of products that some of the other Dealers had to contend with, ours felt like a lithe guerilla operation. Plus, I had the best team! Getting There would have been impossible without my official T19 Flight Crew, Bryce (Maurice) and Thomas. Hauling, parking, re-parking, setting up, coffee runs, videography, they did it all and had fun doing it. I can't thank you guys enough for your help. For me, Getting There was official when my friend Jon appeared out of nowhere. He'd flown up from San Francisco just to see my space ship and having him along for the ride totally made the show for me. I'm one of those adult males who is awkward hugging people but I admit I grabbed him like a bear wrestler before I knew what I was doing. For an Evil Robot, Jon is a great friend and when he showed up things went from Getting There to Being There. That makes three, if you are counting. And since this marks the second consecutive year of partially intensive SmBlog reporting I'd just like to thank someone for something, without whom some other things would have never been whatever they turned out to be. 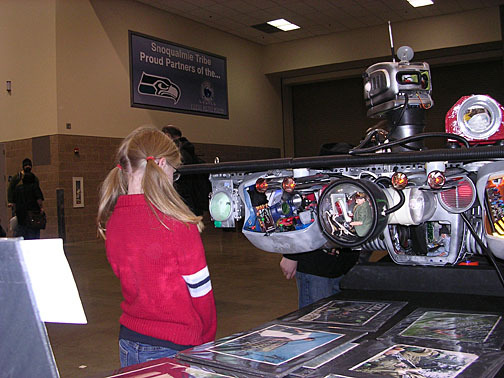 The Emerald City ComiCon was great fun. I have pictures and analysis to prove this observation and will post them in a proud and silly row during the next few weeks, so please stay tuned to this SmBlog if you appreciate that kind of thing. I have to start with this picture I took of a great kid named Jordan, as seen through the bubble windows of T19's Blue Velcro Lounge. Although there was great praise from many other key demographics, the 2-12 year old set was my most dependable audience. Thanks to Jordan and his very kind Aunty for this glorious and pleasantly iconoclastic proof of scale, and a fabulous jumping-off point for SmBlog Page #3.